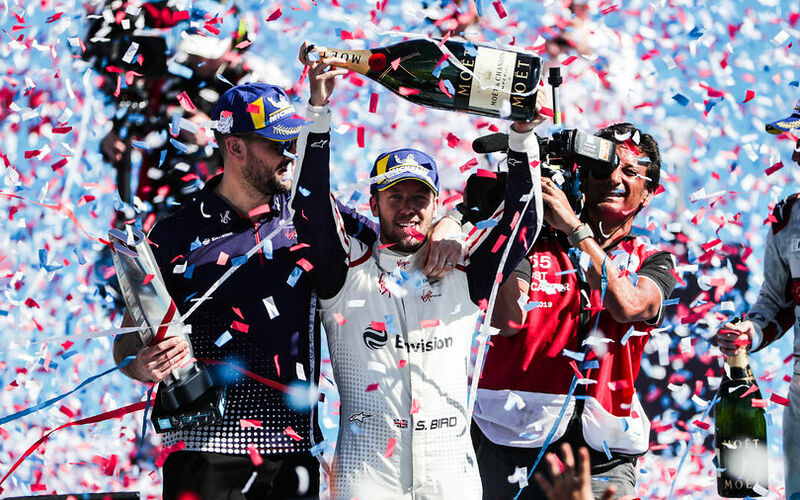 Sam Bird became the third winner in as many races as he beat Formula E rookie Pascal Wehrlein to the victory in a controversial and entertaining Santiago e-Prix in which a number of drivers were awarded penalties after the chequered flag for contact in the race. Both provisional pole-man Di Grassi and 5th placed Vandoorne ended the qualifying session with the threat of penalties hanging over them, Di Grassi for a procedural infraction on his cool down lap in group qualifying and Vandoorne for failing to leave the pits in a timely manner in the super pole session (the driver must leave the pits before the preceding driver crosses the pit exit safety car line) with the safety car exit traffic light showing red. Ahead of the race Di Grassi was excluded from the qualifying result and will start 22nd (an unfortunate run of luck in Chile as he was also given a 10 place grid penalty at last season's Santiago e-Prix), promoting Buemi to pole and Wehrlein to second. While Vandoorne had his time from the super pole session axed, but remains in 5th with Di Grassi's penalty and Bird moving ahead. The requirement for the 225kW attack mode was confirmed in the hour ahead of the race as 2 activations of 4 minutes each, for the third race in succession, with the activation zone situated on the outside of turn 3. Vandoorne topped the voting for the 25kW fan-assisted boost for the third race in succession though his share of the vote has reduced each time (from 36% in Ad Diriyah to 25% in Marrakesh to 16% in Santiago). Da Costa also gets his third fan boost, while Buemi and Abt each received the boost for the second time this season and D'Ambrosio gets his first boost. From the start the pole man Buemi led away from Wehrlein, Bird was immediately trying to pass Abt in turn 3, later making the move stick into the turn 13 hairpin. It was a fairly controlled first lap for Formula E with minimal contact, but Di Grassi was forced to short cut the first chicane to avoid the NIO cars who had tangled with Piquet. At the end of the first lap Tom Dillmann stopped between turn 12 and 13, bringing out the yellow flag and losing a lap, he managed to get going again but retired later on. Contra to the strategy employed in Marrakesh as the teams try to work out the new system, Buemi armed his attack mode just 7 minutes into the race as he attempted to pull away from Wehrlein in second. At this point in the race the top three were pulling away from Abt, meanwhile Massa and Rowland reignited their fight from Marrakesh, battling over 9th and 10th. 10 minutes into the race Vergne was spun around in the fight for 14th as Lotterer misplaced his braking, hitting the back of Da Costa, who in turn was pushed into the back of Vergne. Vergne dropped down to 20th while Da Costa was forced to slow with damage. In the meantime Bird was closing on Wehrlein, and chose to arm his attack mode as he had a sufficient gap to Abt. A few laps later Bird was close enough to attack, hitting the back of Wehrlein in turn 14, before making the pass into turn 1. Wehrlein immediately dove for the attack mode line to try and come back at Bird but in the following laps dropped back while Bird attacked Buemi for the lead. The slightly fraught relationship between Massa and Rowland was further tested with 28 minutes left in the race, as Sims made a move on Gunther for 7th Rowland opportunistically slipped past Massa, driving him into the outer wall on the exit and damaging the Brazilians' steering. The full course yellow was then called as a lap later Gunther stopped on track between turn 14 and the pit entry. Di Grassi had progressed 10 places through the field after his grid penalty into 12th but prior to the full course yellow he had ploughed into the back of the Dragon of Lopez under the yellow flag for Gunther, which would later earn him a time penalty to be added to his race time. After the full course yellow and with 22 minutes +1 lap of the race to run Bird immediately attacked Buemi, who defended his position expertly into turn 1. Vandoorne's poor luck continued as he then hit the wall through turn 3, hitting the marbles while defending his position, he lost his front wing and broke the front right track rod and had to retire. The marbles being a combination of tyre rubber but also a result of the track surface starting to break up as happened in Putrajaya in season 1. The full course yellow had to be called for a second time to allow the debris to be cleared. HWA's terrible start to the season carried on when Paffett was given a drive through for exceeding the maximum power usage, they remain the only team yet to score a championship point. When the second green flag was flown the top 3 had closed up again, with Bird attacking Buemi and Wehrlein attacking Bird. With 16 minutes + 1 lap to go Buemi locked up into turn 7, where he crashed in practice, sliding wide onto the marbles and into the outer wall gifting Bird the lead, he managed to return to the pits but the car was too damaged to continue. At the same time Vergne was forced to retire after suffering a spin and a few laps later Da Costa was also forced to retire, making it a bad day for the championship front runners. With 10 minutes to go Abt employed his fan boost to try and pass Sims for the final podium spot, attempting the pass into turn 3, by now the track was really disintegrating and Abt had to significantly slow to avoid Vandoorne's fate. Frijns had made good progress through the field having suffered in qualifying by being in group 1 and attempted to make a move on Mortara for 5th, nearly being put into the wall by the Venturi driver in defence. The gen 2 car battery represents a significant improvement over the gen 1 car in terms of thermal management, even so in the last 5 minutes of the race the high air temperature of 37°C meant a number of drivers approached a critical temperature in their batteries and had to slow to cool the cells; chief amongst them was Wehrlein, who had caught to within 0.3s of Bird in the lead. With Wehrlein so slow Bird could coast to save his own battery, taking a comfortable win by 6.5s with Sims crossing the line in 3rd. After the flag a number of drivers were given penalties, including Di Grassi as explained above, Sims who had earlier touched Mortara into a spin, and Lopez who exceeded the maximum power. Sims was given a time penalty which handed the final podium to Abt, while Lopez dropped down the top 10 and Di Grassi out of the points after a solid recovery run following his qualifying penalty. The penalties pushed D'Ambrosio into 8th giving him enough points to retain the lead in the championship, but only by 1 point from Sam Bird who moves into second place on 43 points. Non finishes for Da Costa and Vergne mean they are joined on 28 points by Frijns in joint 3rd.